Studies have shown children who receive proper nutrition perform better in school. 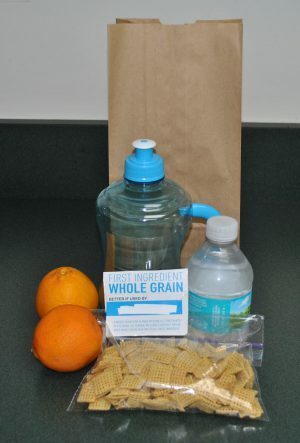 When it comes to packing school lunches, the possibilities are endless. However, not all possibilities are created equal. The key to packing a lunch kids will enjoy is planning. Here are a few tips for breaking away from bland and boring to create lunches which are healthy and delicious. Focus on fruits and veggies. Raw fruits and vegetables are the perfect addition to any school lunch. Not only are they full of flavor and packed with good vitamins and minerals, they are also portable. Toss in an orange, some grapes, or a bag of baby carrots to add color and nutrition to any packed lunch. Spice things up. Are plain fruit or vegetables not appealing? Try adding a flavorful dip to go with them. Low-fat yogurt sweetened with a bit of honey is great with fruits like apples and melons. Low-fat ranch dressing is always a kid-friendly dip for vegetables such as carrots, celery, peppers, and broccoli. Hone in on whole grains. Sandwiches are school lunch staples. Add a boost of fiber and flavor by using whole grain bread. Instead of potato chips, which are high in fat and salt, try adding a serving of dry, whole grain cereal to the mix to satisfy that crunchy craving. Read the food label. Prepackaged foods are super convenient and easy to pack, but be careful. When choosing single-serve items such as canned fruit or lunch packs, make sure to look for the healthiest options available. Avoid items with added sugars or little or no fiber, as these items deliver less nutrition. Rethink the drink. Cans of soda or boxes of fruit-flavored punch are common additions to a lot of school lunches, but many of these products are high in calories without offering any real nutrition. When choosing a drink to pack, bottled water – or better yet, refillable containers – and real fruit juice are the best choices. Keep calcium in mind. Low-fat dairy foods such as cheese sticks, yogurt, and cottage cheese are excellent additions to any healthy lunch. These foods are rich in calcium and vitamin D, both of which are vital to strong bones and teeth. Lactose intolerant? Try leafy greens for added calcium or orange juice fortified with vitamin D instead of dairy. Try something new. School lunches do not have to be dull. Sure, a sandwich, a bag of chips, a fruit cup, and a juice box are easy to pack, but they can get boring quickly. Try packing leftovers from last night’s dinner in a reusable container or make foods more fun by cutting them into unusual shapes. Remember food safety. Packing lunches in soft-sided insulated bags is the best way to keep food colder longer. Avoid cross-contamination by packing different foods in separate bags or containers which seal tightly. Do not reuse paper lunch bags, plastic baggies, or aluminum foil. Discard any food remaining at the end of the day. Proper nutrition is essential to a child’s success in school. When a child is hungry or undernourished, the consequences can be far-reaching. Taking the time to plan and pack wholesome school lunches can provide children with the foundation needed to not just survive the school day, but to thrive in it.